The NMC have currently gone out to consultation on the draft standards in proficiency for registered nurses, the deadline for the consultation is the 12th September 2017. We believe that nurses’s of the future require not only great insight into their patients needs, but also insight into the factors that positively or negatively influence their own safety performance and that of those around them. 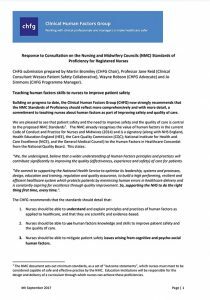 For that reason the Clinical Human Factors Group (CHFG) strongly recommends that NMC Standards for nurse education, currently under review, should reflect more comprehensively and with more detail, a commitment to teaching nurses about human factors as part of improving safety and quality of care. We have outlined our recommendation in our response to the NMC consultation. Please download our response below.